After Pastor has delivered yet another phenomenal message, he received by God, he is then replenished in a circle of prayer by hand selected Visions Selah Prayer Worshipers. "Enter into his gates with thanksgiving and into his courts with praise, be thankful unto him and bless his name. For the Lord is good his mercy is everlasting and his truth endureth to all generations. Sopranos; Kameesha Robertson, Alto; Lillette Rumley & Marshea Warner, and Tenor; Bobby Carr harmonize to make beautiful music to expresses adoration to our Lord and Savior, Jesus Christ. Being led by the spirit, they diligently seek to please God and catapult the congregation toward a great experience in Him. 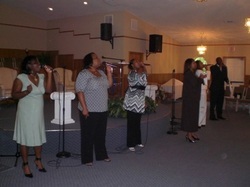 At Visions Selah, Praise is What we Do!